Northwestern’s Alice Millar Chapel turns 53 this year. A concert will be held on Sunday in honor of its birthday. An honorary concert will be held in the Alice Millar Chapel this weekend as the historic building turns 53 years old this year. The concert — which is performed annually — will feature the Alice Millar Chapel Choir and the Northwestern University Symphony Orchestra. 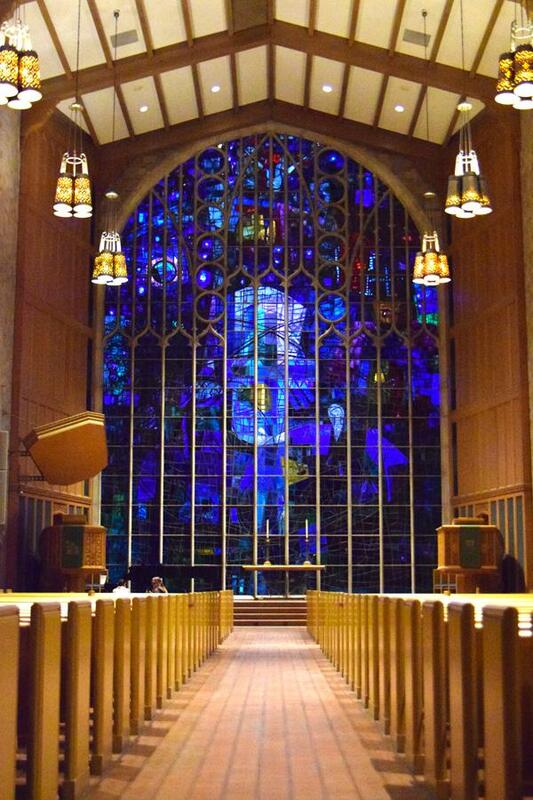 With a 151-foot spire and a colorful display of stained glass, the Alice Millar Chapel has been a treasured Northwestern venue for weddings, concerts and more for the past 53 years, said Bienen professor and Chapel Choir director Stephen Alltop. The chapel, completed in 1962, was the gift of University trustee Foster G. McGaw and Mary Wettling Vail McGaw. McGaw named the chapel after his mother, Alice Millar, a musician who studied music in Germany and France and once played for Queen Victoria. This year’s program includes three different pieces that will be performed by instruments such as the harp and pipe organ. Alltop said the Alice Millar Chapel is notable for its pipe organ which has over five thousand pipes, making it much larger than the average organ and one of the largest in the Chicago area. In the concert, the organ will be a significant component in the performance of a concerto written by Francis Poulenc for organ, strings and timpani, Alltop added. Along with the organ, the harp will also be highlighted as an important instrument in the concert. “Ennanga,” named after the traditional Ugandan harp, will be played by a modern harp, Alltop said. He added that “Ennanga” is written by composer William Grant Still for the harp, piano, and strings—an unusual combination of instruments. Bienen junior Autumn Selover will play the harp for the piece and said she is excited the concert is featuring a harp solo prominently. Along with the harp and organ performances, a choral performance will be featured. The choir will perform “Dixit Dominus,” a special choral work written by George Frederick Handel when he was only 23 years old. Alltop said this is a virtuosic choir piece that will offer a wonderful way for the great solo talent in the choir to be featured. Bienen fifth-year senior Lauren Biglow, who is performing in the concert for the fifth year in a row, will be one of the many vocal soloists featured in the last piece of the concert. She added that the birthday concert is unique in that it draws the chapel service community, made up of the people who usually attend services at the chapel, as well as other people in the NU community who may not regularly visit Alice Millar Chapel.